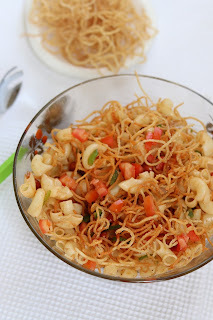 Try out this super crunchy and easy recipe for Pasta Salad. 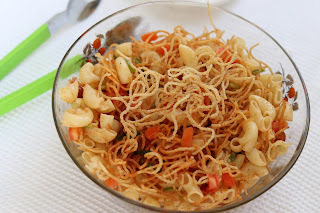 Pasta salad can be served as a snack or appetizer or even for main course recipe. Macaroni pasta is a nice take-along dish for picnics and outdoor barbecues. 1. In boiled macaroni, add tomato ketchup along with salt, black pepper and capsicum. Keep this mixture in refrigerator for 3-4 hours. 2. Coat boiled noodles with rice flour and keep it aside for 10 -15 min. This is make noodles more crisper. 3. Heat oil in a kadai and deep fry noodled till crisp and brown. Drain these noodles on absorbent paper. 4. One macaroni is cold, add crispy and crunchy noodles along with roasted peanuts to it. Top with diced tomatoes.